As his new recipe book indicates, Snoop Dogg has gone from crook to cook. And now it appears he has transformed once again, this time from cook to campaigner. The 47-year-old rapper has long been open about his distaste for the policies of President Donald Trump, and has now laid out – in very clear and colourful terms – his opinion of the partial government shutdown currently dividing the US. Snoop encouraged furloughed workers to think twice before voting for the businessman turned politician in the 2020 election, insisting, ‘[Trump] really don’t give a f*ck about us’. 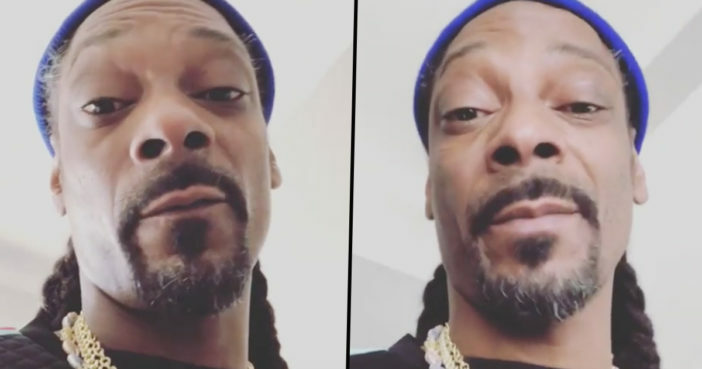 As tensions continued to grow on the 16th day of the shutdown, Snoop uploaded a video to Instagram, addressing individuals whose working lives and salary have been affected. Ain’t no f*cking way in the world y’all can vote for Donald Trump when he come back up again. If y’all do vote for him, y’all some stupid motherf*ckers. All you federal government people that’s not being paid, that’s being treated f*cking unfairly right now. That’s so terrible, and this punk motherf*cker don’t care. So I’m saying that to say this: when the sh*t get back on and y’all get y’all jobs back and it’s time to vote, don’t vote for that n*gga. Please don’t. Look what he do. He just don’t give a f*ck. Y’all honest, blue-collar, hard-working people and suffering. So if he don’t care about y’all, he really don’t give a f*ck about us. So f*ck him too, and f*ck everybody down with Donald Trump. I said it. Yeah, Snoop Dogg. N*gga f*ck him. Shut down the government, n*gga? You’s a piece of sh*t. F*ck you. As reported by The Daily Beast, President Trump has said he is ‘very proud’ of the partial government shutdown. You can call it whatever you want—the Schumer, the Pelosi or Trump shutdown—it doesn’t make any difference to me. They’re just words. The Democrats could solve the Shutdown problem in a very short period of time. All they have to do is approve REAL Border Security (including a Wall), something which everyone, other than drug dealers, human traffickers and criminals, want very badly! This would be so easy to do! As reported by The Guardian, approximately 800,000 federal workers currently remain without pay, with key government services suffering under the strain. Out of these 800,000 affected workers, it is estimated around 420,000 people are currently working while unpaid. Such workers will usually receive backpay after the end of a shutdown. However, there is no guarantee. Meanwhile, amid the shutdown and the hardship federal employees face, the Washington Post reports scores of Trump’s senior political appointees are set to receive raises of up to $10,000 a year.